This was a gig that we had been looking forward to for a very long time. Ever since Rick recanted the tale (again and again!) of hearing his phone ring and when he picked it up a voice on the other end said in a sprightly tone, “Hey Rick…This is Robert!” we knew that a very special night was being planned. The band were booked to play for The Morgan Foundation, which was created in 2001 by businessman Steve Morgan OBE, founder and Chairman of Redrow plc, Chairman of the Bridgemere Group of Companies and owner of Wolverhampton Wanderers FC to help disabled children have better lives. So when the email came in that Steve wanted to know if the band would be ok playing with a guest, we of course agreed that this would be no problem, having played in the past with everyone from Eric Clapton and Bryan Ferry, to Nik Kershaw and Melanie C – and many others – so this was nothing new and something we would absolutely nail! 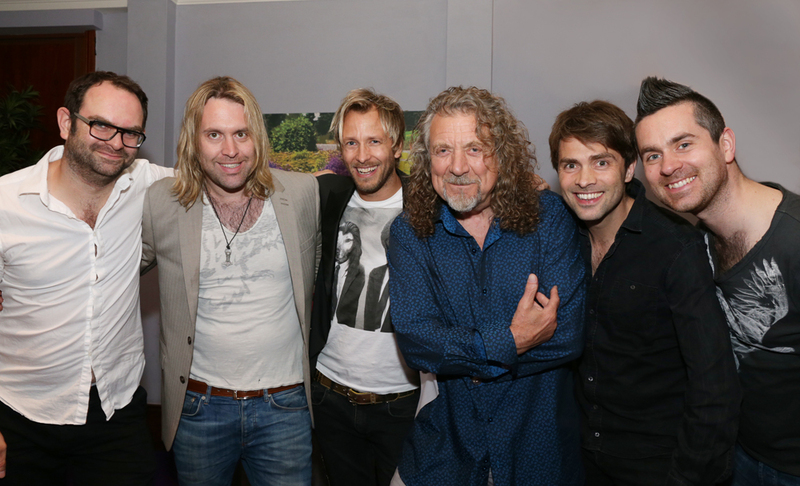 However, when it became apparent that it was Robert Plant, well that was something very special indeed. Notoriously fussy, musically incredible and one of the most celebrated, admired and fearsomely iconic front men in the history of music was about to play with us mere mortals… and we were slightly apprehensive! So off we went up to Cheshire in the trusty RPJ Band bus having rehearsed everything up, and started to load in at the spectacular venue Carden Hall Estate. Mr Plant entered the room whilst we were sound checking and what was immediately apparent was that he was a fantastic guy, a musician through and through that simply enjoyed playing with other musicians; no pretence, no starryness, just a warm smile and an iconic voice that still rips like a hurricane! So the next few hours just disappeared and the boys soon found themselves rocking through ‘Whole Lotta Love’ and ‘Rock and Roll’ …and to see Robert ‘machine gunning’ his mic stand with the boys fully lit was something that will endure forever… The absolute accolade being that he judged us more than good enough to let himself go and simply enjoy it! Awesome! Following this, the night went from strength to strength raising in excess of £445,000! (an absolutely incredible amount! )… and even our front man Rick’s donation of hospitality spaces at British GT then went for a staggering £16,000!!! Wow! The feel-good factor was well and truly established and so when Rick and the boys took to the stage for their own set, the room was primed and ready to go crazy….which is exactly what they did!!! The boys blew the roof off and it was all over far too soon… but not before they had given two encores! What a night! “I’d like to say that you were fantastic…but you were much better than that!” High praise indeed!!! They say you should never meet your heroes, well in this case we didn’t just meet him, we rocked out with him… and it was one of the most incredible nights ever!